Pensacola's residents have endured more than 450 years of destructive hurricanes. The first historically recorded hurricane overwhelmed Don Tristán de Luna's 1559 colonization attempt, destroying most of the ships in his fleet. In 1752, another hurricane drove a subsequent Spanish settlement from Santa Rosa Island. During a three-month siege against the British in 1781, a hurricane struck just three days before Spain's victory. 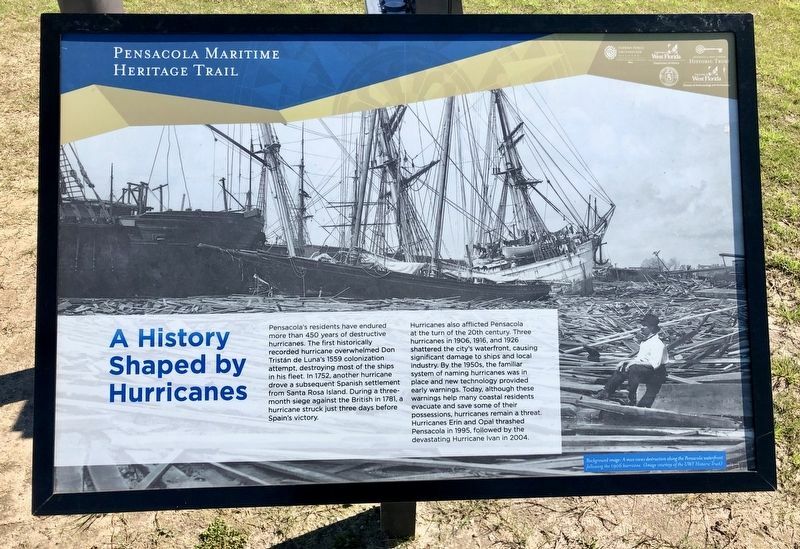 Hurricanes also afflicted Pensacola at the turn of the 20th century. Three hurricanes in 1906, 1916, and 1926 shattered the city's waterfront, causing significant damage to ships and local industry. By the 1950s, the familiar system of naming hurricanes was in place and new technology provided early warnings. Today, although these warnings help many coastal residents evacuate and save some of their possessions, hurricanes remain a threat. Hurricanes Erin and Opal thrashed Pensacola in 1995, followed by the devastating Hurricane Ivan in 2004. 2. 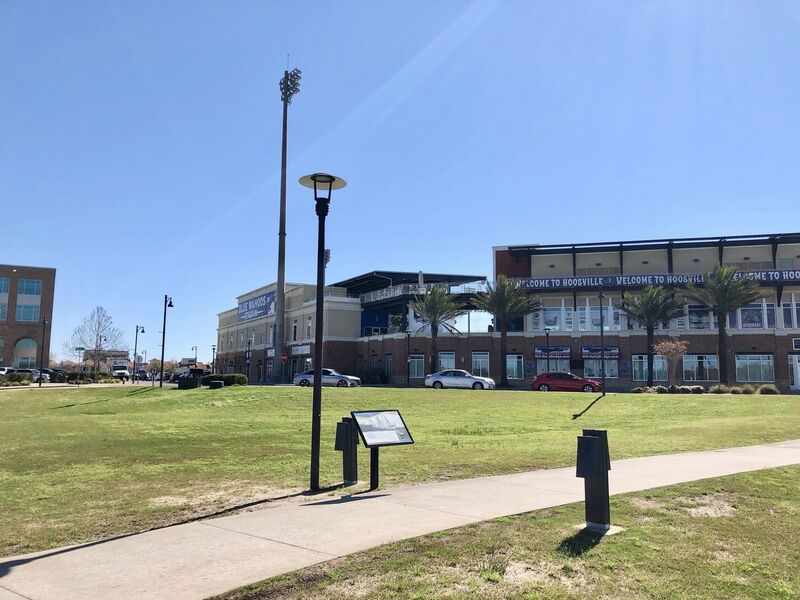 View of marker looking towards Blue Wahoo's Stadium. Location. 30° 24.305′ N, 87° 13.164′ W. Marker is in Pensacola, Florida, in Escambia County. Marker is at the intersection of West Cedar Street and South Reus Street, on the right when traveling west on West Cedar Street. Touch for map. Located between main parking lot and Blue Wahoos Stadium. Marker is at or near this postal address: 351 West Cedar Street, Pensacola FL 32502, United States of America. Touch for directions. Other nearby markers. At least 8 other markers are within walking distance of this marker. "Gloucester of the Gulf" (about 300 feet away, measured in a direct line); Archaeology in a Maritime Community (about 700 feet away); St. Joseph Catholic Church (approx. ¼ mile away); Trader Jon's (approx. 0.3 miles away); Industry At Sea (approx. 0.4 miles away); A New Territory for the U.S. (approx. 0.4 miles away); Gen. Andrew Jackson (approx. 0.4 miles away); Luna Expedition (approx. 0.4 miles away). Touch for a list and map of all markers in Pensacola. More. Search the internet for A History Shaped by Hurricanes. Credits. This page was last revised on March 8, 2019. This page originally submitted on March 8, 2019, by Mark Hilton of Montgomery, Alabama. This page has been viewed 43 times since then. Photos: 1, 2. submitted on March 8, 2019, by Mark Hilton of Montgomery, Alabama.